BHU PET 2015 Result Declared - Check BHU PET 2015 Merit List - Download BHU PET 2015 Counseling Schedule Admission bhu.ac.in. Latest News - Banaras Hindu University has declared result of Post Graduate Entrance Test 2015 24th June 2015 on official website www.bhu.ac.in. BHU PET 2015 was held 16th May to 05th June 2015 on at various centres i.e. Varanasi, Mirzapur (Rajiv Gandhi South Campus – Barkachha, Mirzapur), Gorakhpur, Lucknow, Kolkata, Delhi, Hyderabad and Chennai for admission to M. Lib. & Information Science, M. B. A. [(Agri Business), M. Sc. (Ag. ), M. C. A., M. A. Mass Communication, LL. M. (2-Years), LL.M. (1-Year), LL. M. (HRDE), M. A./M. Sc. (Stats., Maths, Geography, Psycho, and Home Science) and other courses. BHU had invited online application form for admission in various General Courses, Professional Courses and Special Courses. 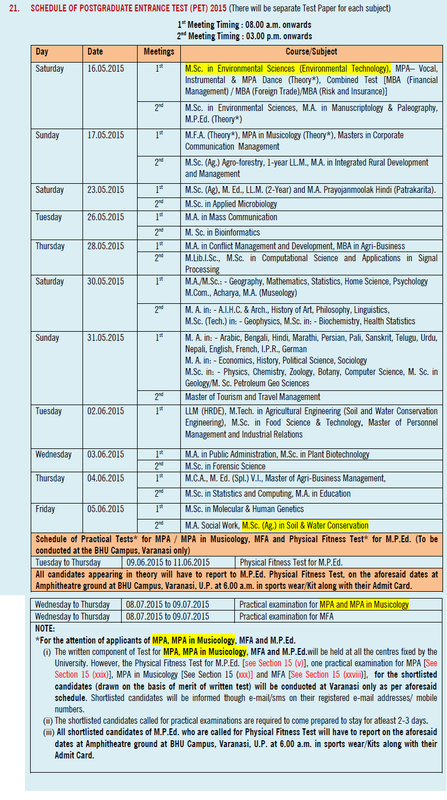 BHU PET 2015 on 12th March 2015 on official website. 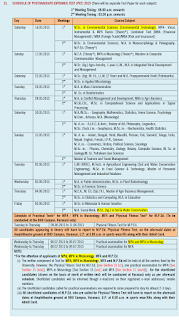 The last date for applying online for BHU PET 2015 was 08th April 2015. A huge numbers of candidates had applied for BHU Post Graduate Entrance Exam 2015 across all over the country. Those candidates who had appeared in BHU PET 2015, they can download their BHU PET 2015 Result from direct link provided below. Candidates must note down that admissions in various courses will be made according to BHU PET 2015 Merit List which will be prepared on the basis of performance in entrance test and eligibility and availability of seats in the particular Course. · Certificate(s) in support of claim for 'Sports Seats'. · High School Certificate/equivalent Certificate. · Intermediate (+2) Certificate/equivalent Certificate. · Mark sheet of the Qualifying Examination (Refer note clause below 21). · Mark sheets of High School/equivalent & Intermediate (+2)/equivalent. · Migration Certificate, if passed from a university other than BHU (To be submitted not later than 90 days of admission). · PET Admit Card issued from the office of the Controller of Examinations, BHU. · SC/ST/OBC Certificate on the basis of which reserved quota seat is claimed.